Revisitation: a series of posts that each feature a quote from a classic source along with a short discussion. Quotes that make me question some previous assumption I had about the game or that seem to lead to otherwise unexpected consequences will be preferred. This spell will cancel the effects of poison and revive a poisoned character if cast within ten rounds. Think about that. Parties with sixth level clerics become significantly less vulnerable to death from poison. Unlike magic-users, clerics have access to their entire spell corpus automatically, so there is no question of the cleric needing to do something special to learn Neutralize Poison (unless you are playing with house rules). Sixth level clerics require 25,000 XP, so while reaching sixth level is an impressive achievement in a reasonably dangerous campaign, it is not in the mythical realm of “name level” abilities that most players never reach. All of this means the attention of the players gradually shifts away from counting food and water and illuminations, simplifying the Normal Equipment part of the character sheet just as the Magic Items inventory becomes more complex. 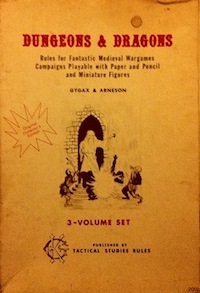 … Which means low-level play was intended to be more focused on nonmagical equipment to solve problems, and high level play focused on magical equipment to solve problems. Though that post is explicitly about AD&D, I think the same observation holds regarding basic D&D. It also shows how the availability (or lack) of specific classes can drastically change the nature of the game. If there are no clerics, then mundane resource management becomes dramatically more important at higher levels (it is always important at lower levels). This says something about party balance that I don’t think is often acknowledged within the OSR, especially since many people (myself included) like the idea that any character can try anything. However, if you don’t have a cleric, you have to carry more rations and be more cautious around poisonous monsters. If you don’t have a magic-user, you need to rely more on ropes and grappling hooks due to the lack of spells such as levitation and fly. Obviously, the point is not absolute, as magic items can take the place of some of these abilities, though the players have less control over whether or not such gear will be available. The “within ten rounds” bit also reminds me of the AD&D death rules (see the Gygax DMG page 82) and the “Hovering on Death’s Door” optional rule from the Second Edition Dungeon Master Guide (page 75). Both of these systems see characters losing 1 HP per round if at 0 or negative HP and actually dying at -10 HP, which mirrors the “dead from poison in ten rounds” suggested by the Neutralize Poison text. Thus, one could think about a failed save against deadly poison as instantly reducing the victim to 0 HP (and unconsciousness) and starting the “final death” clock. (The 1E rules are harsher than the 2E rules, as a near death experience also results in 1-6 turns of coma followed by a week of required rest, but the idea is the same.) Further, this suggests that “death” at 0 HP is not medical death, though it might as well be for low level characters. A bottled poison antidote would also be a reasonable extrapolation from these rules. (Is this already in the rules somewhere? I can’t find such a thing in either the Basic or Expert rule books.) Having antidotes available would turn poison into a resource tax, and would be particularly appropriate in games that also have Raise Dead spells available for a price. My preference would be for antidotes to be not economically viable for low-level characters. Clerical spells are available as scrolls, so Neutralize Poison could also be “bottled” in that way, though a cleric would still be required to use the scroll, unlike an antidote. Scroll creation also offers pricing guidelines; by the magical research rules on page X51, an antidote (really, a Potion of Neutralize Poison) costs 2000 gp and takes 4 weeks to produce. Market price should be higher than that, to allow for profit margin, so I would probably allow PCs to buy antidotes for 2500 gp. Brewing antidotes would be a nice little side business for an entrepreneurial cleric with some free time. Neutralize Poison can’t be used as a prophylactic (such is noted clearly in the text). However, items that provide temporary protection against poison (following the example from the scrolls of protection) might also be interesting treasure items, allowing another level of resource management. This entry was posted in Uncategorized and tagged cleric, revisitation on December 27, 2011 by Necropraxis. I keep missing things like this. My players recently had a scroll of that spell, and if I’d recalled that they had it, they might have kept it for when one of them failed a save or die, rather than use it to neutralise some temporary poison effect.